BIDDERS - Auction access tickets are available at the bottom of this page. This is the Viking Sword that I have devoted the last 2 months of my life to. 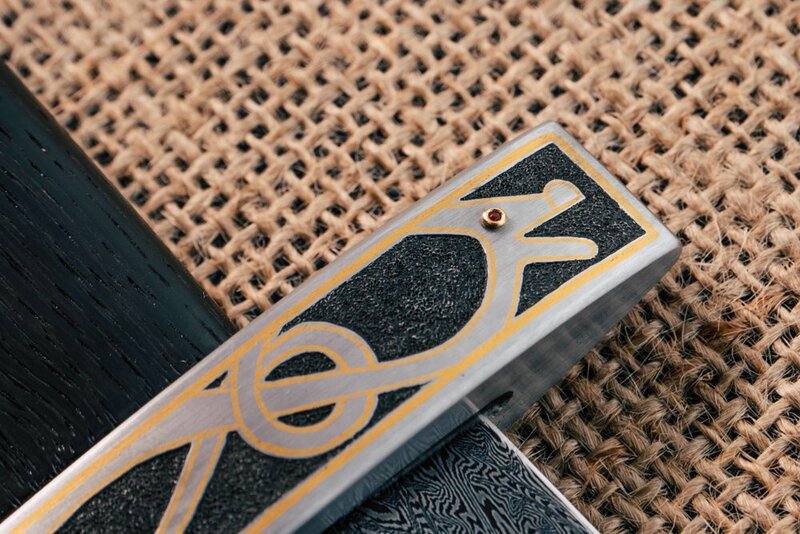 The blade, with a meticulously created ‘explosion twist’ damascus pattern, from 1080 and 15N20 steel, captivates the eye as it is studied. 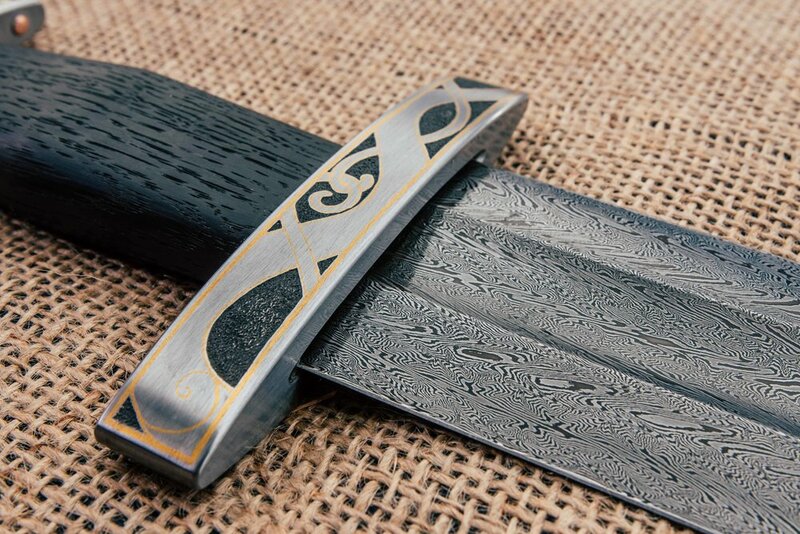 It is designed around a “Type 3” Geibric classification sword and typical in shape and dimension to blades from the mid 10th century. 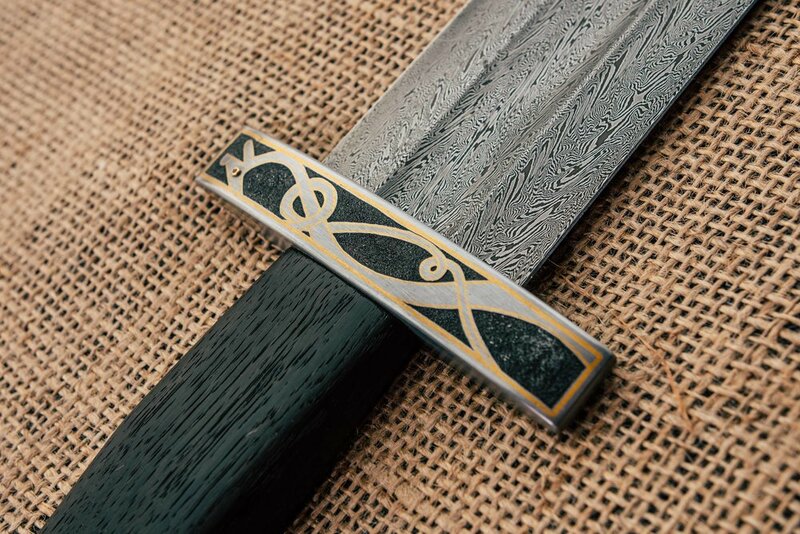 The steel hilt components gave me my largest ever challenge: To learn engraving and gold-inlay. The upper and lower guard were adorned with ‘Jelling’ inspired beasts that wrap from one side to the other. Channels were engraved and gold hammered in to form the outlines of these creatures. It was a gargantuanly time-intensive undertaking, on a microscopic scale. After 4 weeks of engraving they were complete and ready for the setting of the garnets. Another, completely new-to-me skill to quickly practice up on and learn. 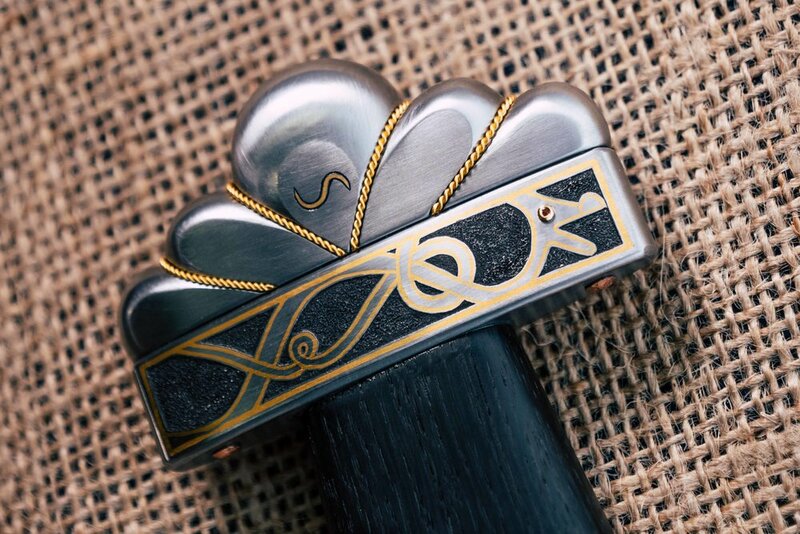 The pommel is adorned with two of my ‘S’ touchmarks, inlayed in gold. The pommel is wrapped in twisted gold wire. The grip itself is crafted from ancient bog-oak and compliments the dark tones throughout this piece. Every step on this project was a new step, with failure and education a theme throughout. It humbled me, frustrated me and excited me. It taught me about patience, it taught me about commitment and it taught me about history. This sword is a pivotal stepping stone in my career as a craftsman and I look forward to being able to send it to its new owner soon. Balance Point: 135mm, 5.3” from guard. 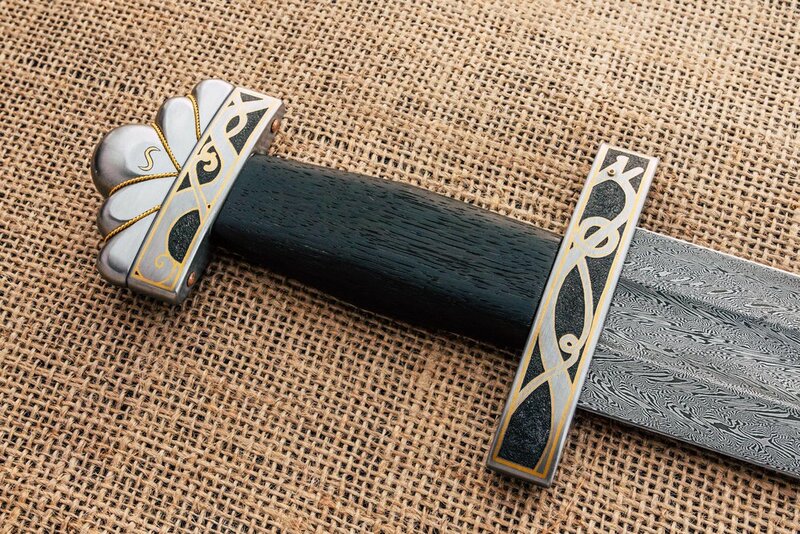 1080 steel, 15N20 steel, mild steel, gold (hallmarked to 18k), garnet, bog-oak, bronze. To participate in the auction of this sword, please purchase an entry ticket below! This is required to ensure participants in the auction are over the age of 18 and to protect the integrity of the auction. Once you receive confirmation of your ticket purchase, you will be given a link to download a document with further information and instructions. You will need to email a photocopy or photo of photo ID proving you are over the age of 18. Without your age confirmation on file, your bids will not be included in the auction. You will also be given the password and the link to the page where you can place your bids on the sword. The auction will end at 8pm BST, 3pm EST, 2pm CST, 1pm MST, 12pm PST on the 27th October 2018. Customers in the UK or EU will be required to pay VAT at 20% on top of the finishing auction price. International buyers will be responsible for all duty, tax, licencing and import costs. The sword can only be sent to countries where the import of swords is legally allowed. Shipping will be included in the final sale price. Payment will be due in full, via bank transfer within 7 days from the auction completion. Dispatch of the sword will be in 14 days from the auction completion, to allow for time to arrange the safest shipping logistics. 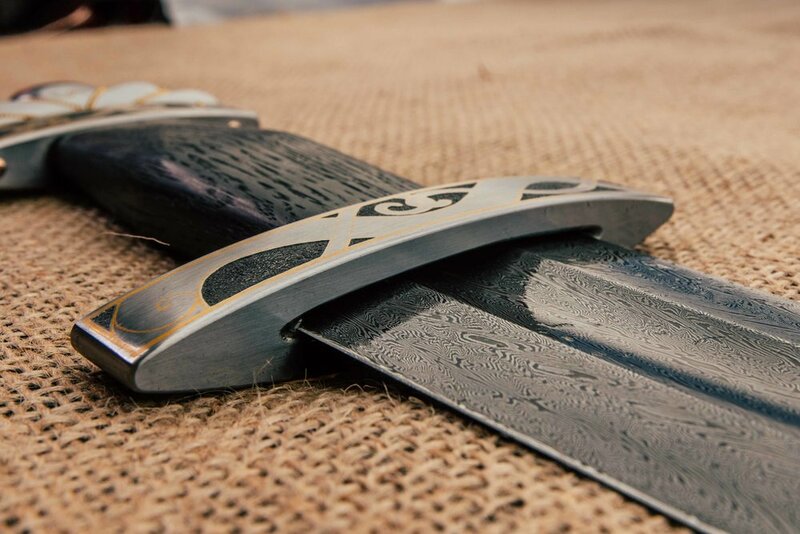 Purchasing this product will give you access to the document of information required for you to participate in the Viking Sword auction bidding. Please note, to participate and bid, you will be required to email photo ID proving you are above the age of 18 within 24 hours of this ticket purchase. Bids without ID on file will not be counted.